Los Angeles-based Maison Louis Marie, best known for their scented candles, has launched a collection of five personal fragrances in Perfume Oil format: Antidris/Cassis, No. 02 Le Long Fond, No. 04 Bois de Balincourt, No. 09 Vallée de Farney and No. 10 Aboukir. Antidris/Cassis ~ "This fruity fragrance begins with a black pepper note enhanced by bergamot & cassis. It then develops a strong green accord with a white rose base and dries down to a warm oakmoss, tonka and clean musk base." No. 02 Le Long Fond ~ "This scent is a savory mixture of hinoki wood accord underlined by notes of cedarwood and patchouli with a strong amber character." Additional notes include white musk. No. 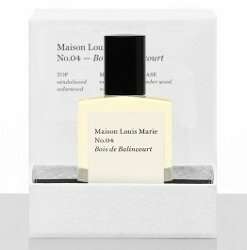 04 Bois de Balincourt (shown) ~ "This scent is a sandalwood fragrance with a dominant cedarwood & sandalwood accord supplemented by a spicy cinnamon nutmeg complex with an earthy vetiver note." No. 09 Vallée de Farney ~ "This scent is a woody, mineral fragrance. The top note is a citrus accord of grapefruit, orange and black pepper enhanced by cedarwood and patchouli." Additional notes include geranium, vetiver, amber, musk and benzoin. No. 10 Aboukir ~ "This fragrance has a spicy eucalyptus top note with a floral amber heart composed of jasmine, lavender, carnation and a rich amber accord. The base notes of the fragrance incorporate a definitive woody accord of patchouli, cedarwood and vetiver with a sweet tonka bean accord." Additional notes include lemon, nutmeg and amber. Maison Louis Marie Antidris/Cassis, No. 02 Le Long Fond, No. 04 Bois de Balincourt, No. 09 Vallée de Farney and No. 10 Aboukir are $57 each for 15 ml. No. 10 sounds really interesting. I’m not positive but I think the four numbered scents match candles already in the collection…and No. 10 especially sounds like a great candle! I do love eucalyptus.